The Quarterly Census of Employment and Wages http://www.bls.gov/cew) reports the number of employers (establishments) and workers covered by unemployment insurance. Since 1978, farm employers who paid $20,000 a year or more in wages, or who hired at least 10 workers on 20 days in 20 weeks during the year, must cover their workers under the UI system. Bureau of Labor Statistics estimates that an average 1.2 million wage and salary workers in agriculture, about 92 percent, are included in the data. 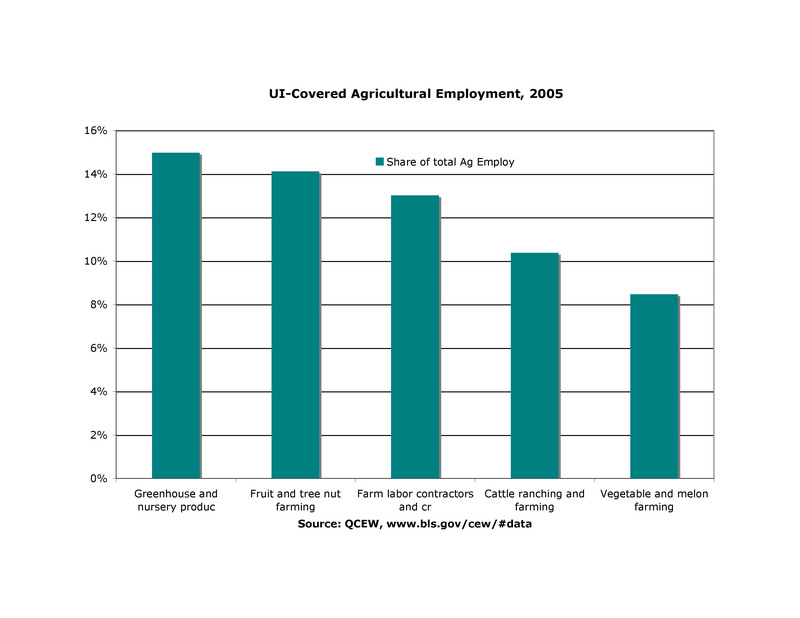 Five sectors of agriculture accounted for 61 percent of Unemployment Insurance-covered employment in 2005, led by greenhouses and nurseries with 15 percent and fruit and nut farms with 14 percent. The average weekly wage for all those employed in agriculture was $445 a week in 2005. Greenhouses paid slightly more than average, while fruit, farm labor contractors, and vegetable farms paid less than average.